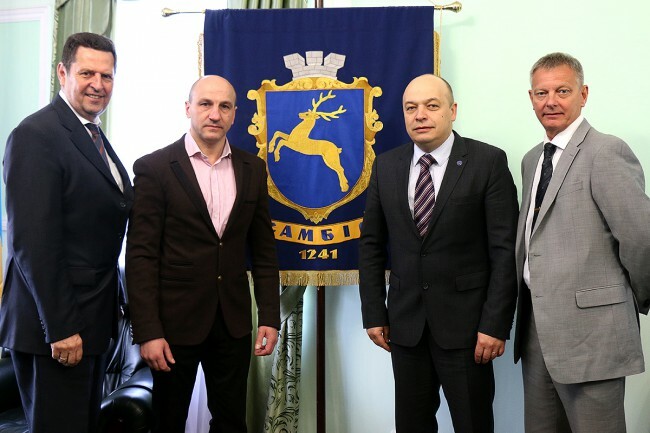 A delegation of four members of the European Parliament were in Sambir in the Lviv Region of Ukraine today to observe reform measures carried out by Sambir Police Station since last year. The Sambir project, supported by the European Union Advisory Mission (EUAM) Ukraine, has resulted in improvements in work practices and a reduction in response times by police in the region. While complimenting the cooperation between Sambir police and EUAM, Ms Inge Gräßle – a member of the European People’s Party – cautioned that this positive example of police reform was “just a first step” and needed to be followed up with sustainable action. Ms Gräßle is leading a delegation of the Budgetary Committee of the European Parliament on a four-day visit to Ukraine. The Committee’s task is to examine and evaluate how EU money is being spent in Ukraine. The Head of EUAM, Mr Kęstutis Lančinskas, said that the challenge now would be to build upon the example of Sambir. He also said that the EU mission, officially launched in December 2014, has decided to base a number of its staff in Lviv on a full-time basis. EUAM provides advice, training and equipment in order to assist with reform of Ukrainian law-enforcement and rule of law agencies such as the Ministry of Internal Affairs, National Police, General Prosecutor’s Office, Security Service, and National Anti-Corruption Bureau. Basing staff in Lviv will allow the mission to deliver more sustainable support to its partners at a regional level.